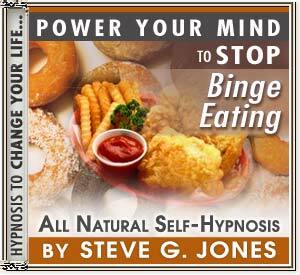 Power Your Mind naturally with Hypnosis to stop the destructive habit of binge eating - for good! TAKE CHARGE OF YOUR LIFE !!! This NEW powerful self hypnosis CD and MP3 will give you the power you need to finally overcome being a binge eater!!! Binge eating can be so miserable. Often a lonely and desperate experience, binge eating can damage self esteem, impact health and cause weight gain. Binge eating can take over a person's life, leading to stockpiling of fattening foods, and planning when to privately 'pig out' . Bingeing may follow a period of attempted weight loss, sometimes leading to the now well-known phenomenon of yo-yo dieting - a dangerous and ineffective dietary pattern. In some ways, binge eating is a natural response. In ancient times humans had to gorge on any food that was available because as food was often scarce. Now food is everywhere in the western world, making this old pattern redundant - although the unconscious mind can still use it of course. This Binge eating Hypnosis CD or binge eating hypnosis MP3 can help you switch off this old out-of-date pattern to give you more control over your eating. Not only will this Binge eating hypnotherapy CD or Mp3 bring you closer to any weight loss goals you may have, but you will also gain more self respect and generally feel better about yourself. However to stop binge eating you need to be motivated - it can feel easy and natural when you go about it the right way.By using my binge eating hypnosis Cd or binge eating hypnosis Mp3, Stopping binge eating can make you feel so much better about standing up to your binge gremlins and kicking the gorge habit for good! Can hypnosis really stop those episodes of binge eating? It certainly can and it does it by targeting the emotional triggers that lead to the harmful cycle of binging. Hypnosis gets to the root of the problem. Binge eating is only the symptom of some underlying problem. With hypnosis you can treat the cause and not just cover it up with food. Binge eaters benefit in many ways from hypnosis. It is a slightly different technique than that used in overall weight loss programs that rely on hypnosis. With binge eating, the person engaging in the feeding frenzy isn't necessarily overweight. Binge eaters come in all different sizes and shapes and with many different emotional triggers. Hypnosis is effective in helping binge eaters because it is able to replace one emotional response with another. For example, if a phone call from an estranged parent would normally send you to the refrigerator in order to deal with the emotional stress, hypnosis allows your mind to form another reaction from the same stimulus. When the call comes instead of raiding the pantry, you will be predisposed through hypnosis to take deep breaths and then seek your own pre-determined alternative. Perhaps it will be to run for 20 minutes on the treadmill or to start frantically cleaning everything in sight. Hypnosis allows you to make a conscious decision about your new positive response. Hypnosis becomes effective within just 3 weeks of therapy. It works by relaxing the body and mind both so that the mind is receptive to a new way of responding. Dr. Steve G. Jones M.Ed. is a clinical hypnotherapist who has taken these principles of hypnosis and turned them into a program called, "STOP Binge Eating." In no time, triggers that once led to binging will now engage a much healthier response.